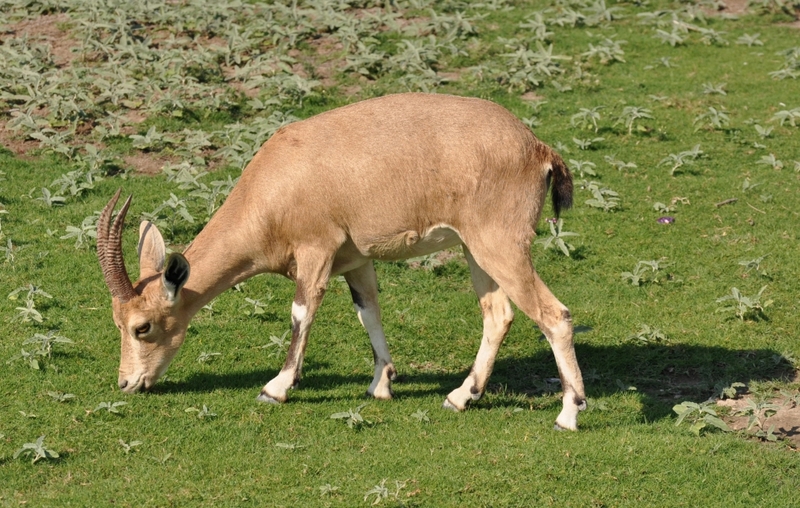 Hazor is first mentioned in the Bible in Josh. 11 in the days of the conquest under Joshua. Having conquered the central and then southern regions of Canaan, the victory of Hazor established Israel’s “toehold” in the north, for as Josh. 11:10 explains, “Joshua turned back at that time and took Hazor, and struck its king with the sword; for Hazor was formerly the head of all those kingdoms.” Or, as the NET renders the text, “for Hazor was at that time the leader of all these kingdoms.” As such, it was the head of a confederation of several Canaanite cities in the battle against Joshua & Israel’s forces at the waters of Merom. 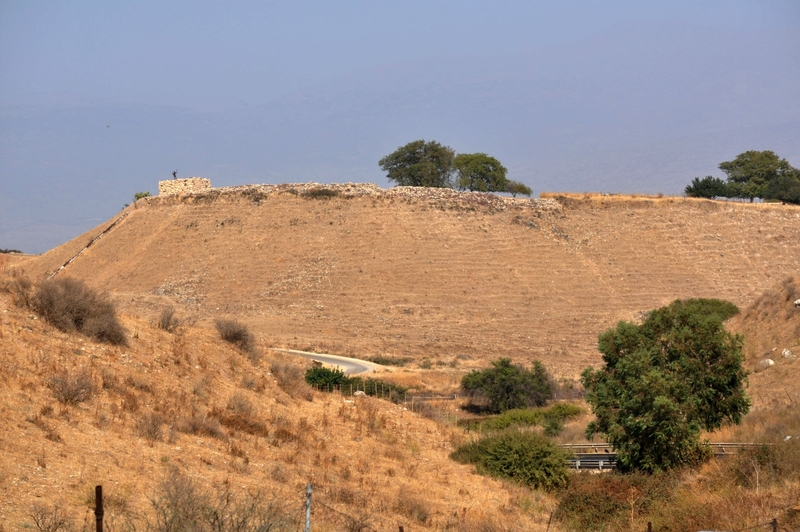 Nelson’s NIBD says, “Hazor was one of the most important fortresses in the land (Josh. 11:10). This was due to its enormous size, its large population, and its strategic location of the main road between Egypt and Mesopotamia” (p.546). It is recorded in the next verse, Josh. 11:11, that Joshua burned Hazor down, but not the surrounding cities. Verse 13 continues: “But as for the cities that stood on their mounds, Israel burned none of them, except Hazor only, which Joshua burned.” The standard procedure during the conquest was not to burn down the cities—God was giving them to Israel as their inheritance in which to live. Therefore it should not surprise us when the “critic” says there is not a lot of evidence of destruction, etc., to date Joshua’s conquest of Israel. There is a big difference between destruction and conquest. I.e., cities such as Jericho, Ai, and Hazor were the exceptions and not the rule. Biblical Hazor. “Formerly the head of all those kingdoms” (Josh. 11:10). Note the watchtower at upper left. Photo by Leon Mauldin. Between the time of the Conquest and the time of the Judges, Hazor had rallied and was again a very serious threat, as God allowed the armies of Hazor to oppress the Israelites because of Israel’s sinfulness (Judges 4:1-3). These were the days in which God raised up Deborah to be judge and prophetess; Israel’s army was led by Barak (Judges 4-5). 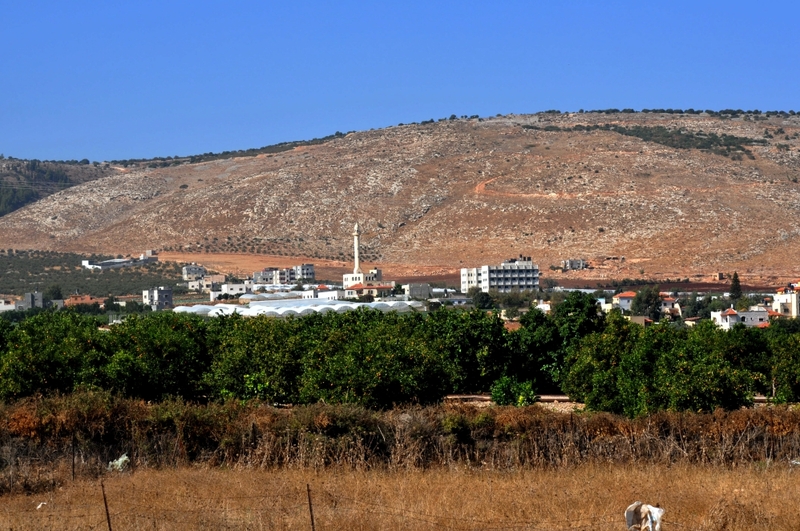 Solomon made Hazor one of his fortified cities, which functioned as a military outpost (1 Kings 9:15). It continued to be an important city until its destruction by Tiglath-Pileser in 732 B.C. (2 Kings 15:29). The Solomonic gates, like those at Megiddo and Gezer, were an important feature of the city. 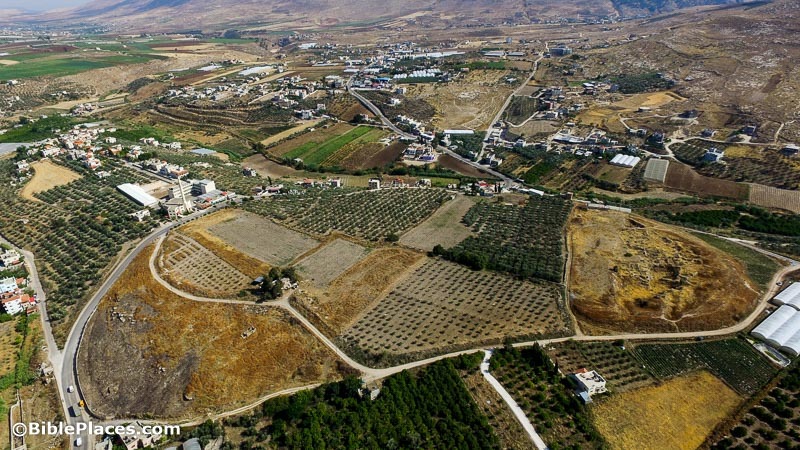 The city of Hazor occupied some 200 acres, making it the largest city in ancient Israel. Hazor is now the largest archaeological site in Israel. 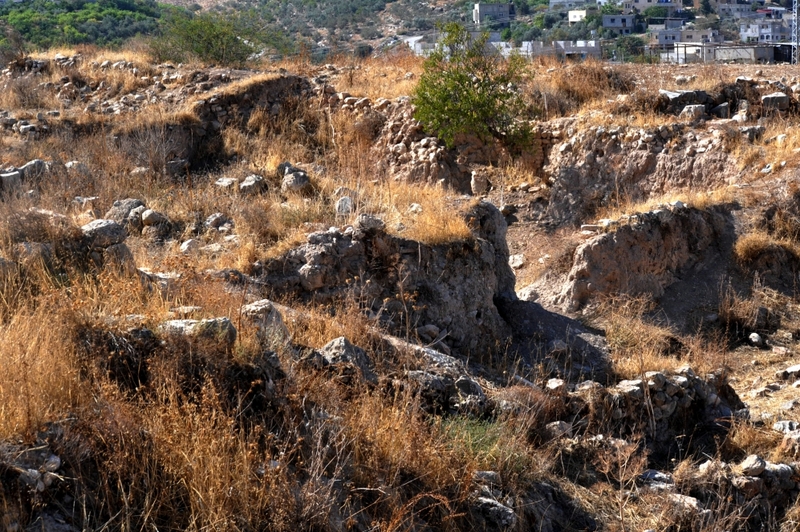 Remains show not only evidence of Israel’s occupation, but also prior Canaanite structures as well. 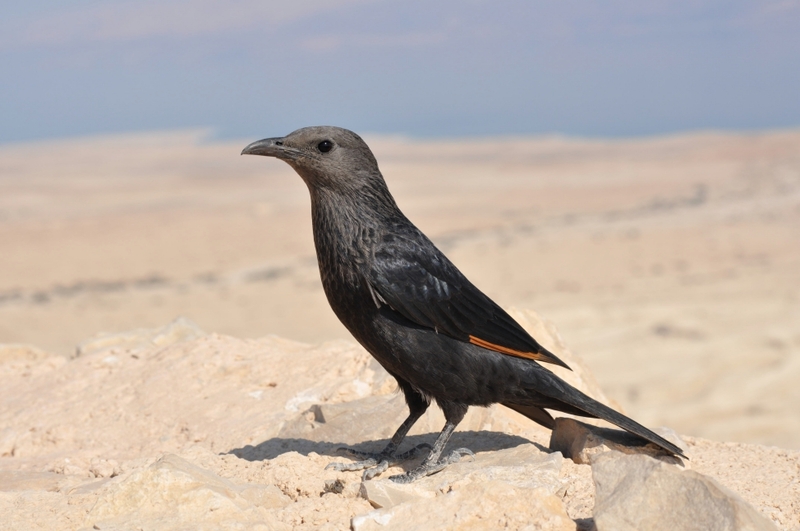 Extra-biblical references to Hazor: Hazor is previously mentioned in the Egyptian Execration texts from the 19th or 18th century B.C. It is listed in the Mari documents of the 18th century B.C. as one of the major commercial centers in the Fertile Crescent. Hazor is also mentioned in the Egyptian documents of the New Kingdom, such as the city lists of Tutmoses III, as well as Amenhotep II and Seti I.
I’ve previously posted on Hazor here and here. 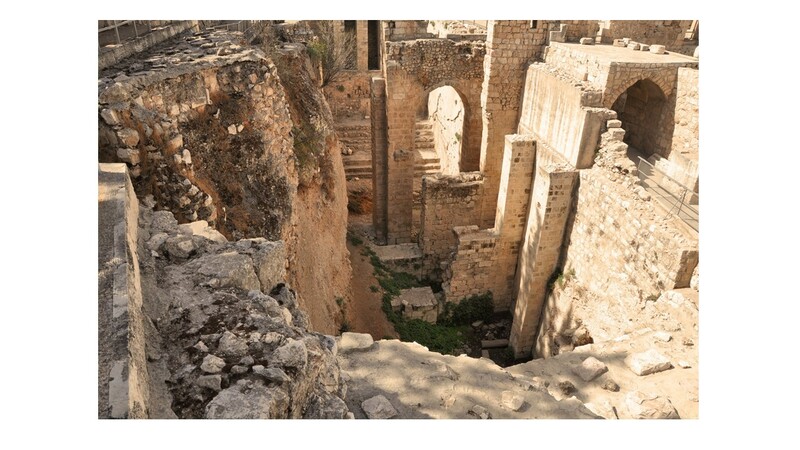 On our recent trip to Israel, while we were in the area of the Antonia Fortress, our guide Zack showed us some artwork that I found to be a helpful illustration of the area north of the temple in Jerusalem. Pools of Jerusalem. Shows area north of temple mount. Photo by Leon Mauldin. This is useful for showing the location of the Antonia Fortress, which would have housed the Roman soldiers stationed in Jerusalem to keep peace (to the chagrin of the Jewish nation). While many believe that it would have been here that Jesus was put on trial before Pilate, it is more likely that Pilate would have been at Herod’s palace there in Jerusalem. For more on this, see the excellent post by Ferrell Jenkins here. The Antonia Fortress would have been the location of the barracks where Paul was taken when some Jews in Jerusalem were enraged to the point of seeking to kill him: “the commanding officer ordered Paul to be brought back into the barracks. He told them to interrogate Paul by beating him with a lash so that he could find out the reason the crowd was shouting at Paul in this way (Acts 22:24, NET). This illustration is also helpful in visualizing the setting of John 5, where Jesus healed the man who had been paralyzed thirty-eight years: “Now there is in Jerusalem by the Sheep Gate a pool, which is called in Hebrew, Bethesda, having five porches” (v.2). 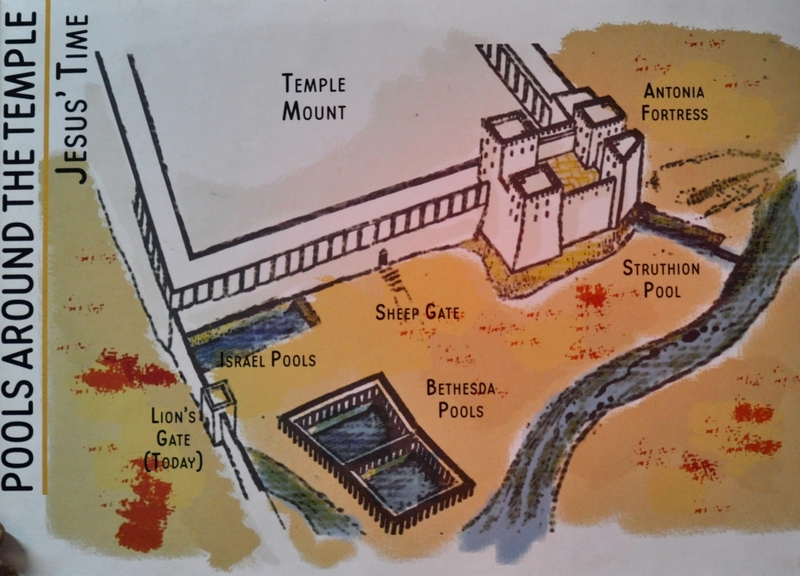 Here you can see the location of the sheep gate, as well as the twin pools of Bethesda. 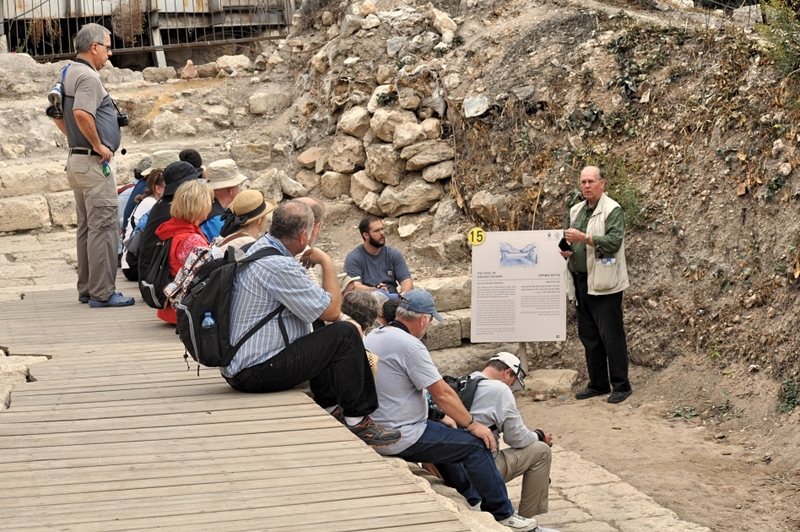 Excavations at the Pool of Bethesda. Photo by Leon Mauldin. My previous posts on Bethesda can be seen by clicking here, here, here and here. When you study the Bible, you are studying real events, real places, real people! Today was a walking tour of Jerusalem. 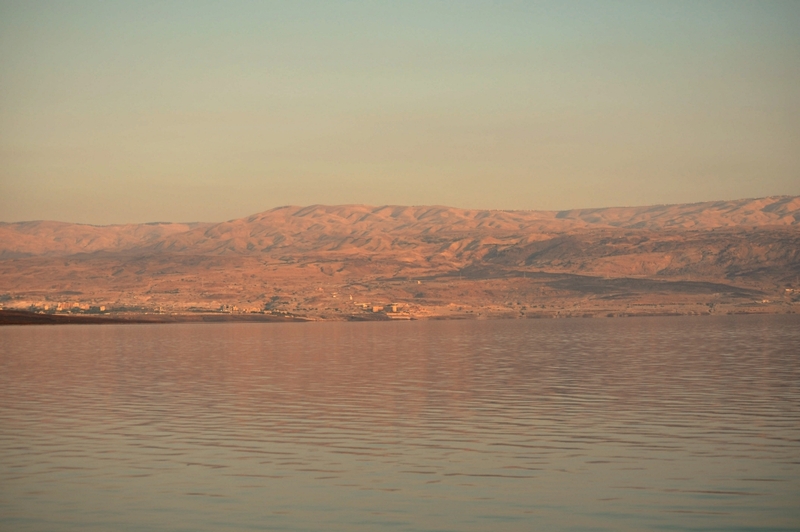 One of my favorite sites (among others) is the pool of Siloam, referenced in John 9. This site was excavated in late 2004. Jesus anointed with clay the eyes of the man born blind, and told him to go to this pool to wash his eyes. He did so, and he went away seeing. This miracle was evidence to validate Jesus’ claim that He was the light of the world (John 9:5). 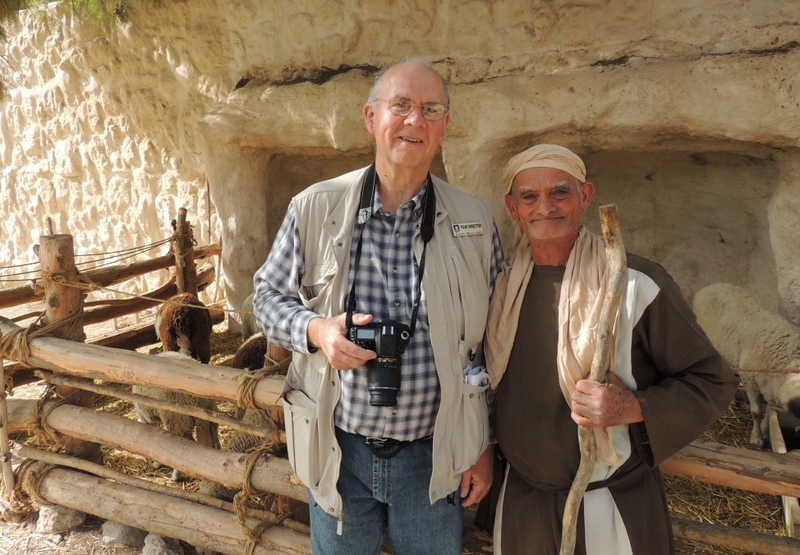 At the pool of Siloam, where the blind man received his sight (John 9). Photo by Zachary Shavin. Now as Jesus passed by, He saw a man who was blind from birth. 2 And His disciples asked Him, saying, “Rabbi, who sinned, this man or his parents, that he was born blind?” 3 Jesus answered, “Neither this man nor his parents sinned, but that the works of God should be revealed in him. 4 “I must work the works of Him who sent Me while it is day; the night is coming when no one can work. 5 “As long as I am in the world, I am the light of the world.” 6 When He had said these things, He spat on the ground and made clay with the saliva; and He anointed the eyes of the blind man with the clay. 7 And He said to him, “Go, wash in the pool of Siloam” (which is translated, Sent). So he went and washed, and came back seeing. We have previously posted on Siloam here and here. Click on image for larger view. Thanks for following our travels. This morning we began the day with a visit to the Mount of Olives. We then saw Gethsemane where we reflected, read appropriate passages, and sang. 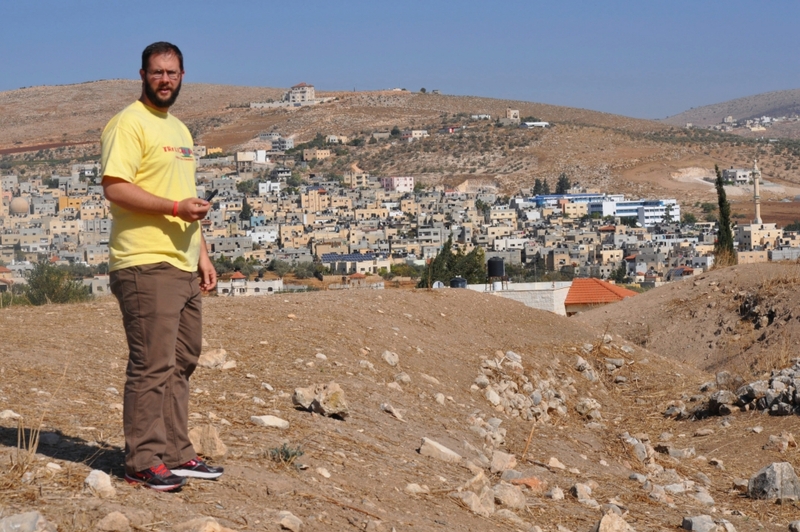 We walked through Kidron to the southern end of the temple mount. We ended the day with a visit to Bethlehem. Group Photo Mt. of Olives. Photo ©Leon Mauldin. 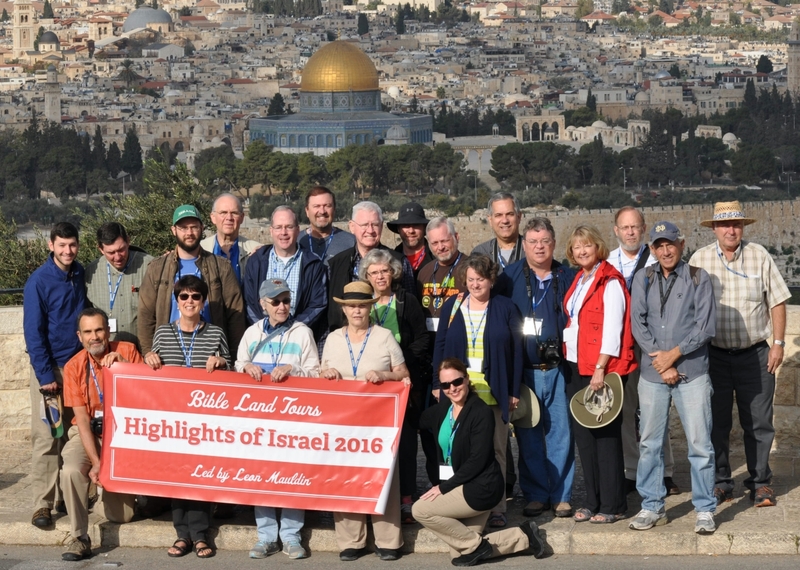 We paused for a group shot while on the Mount of Olives. 4 And being assembled together with them, He commanded them not to depart from Jerusalem, but to wait for the Promise of the Father, “which,” He said, “you have heard from Me; 5 “for John truly baptized with water, but you shall be baptized with the Holy Spirit not many days from now.” 6 Therefore, when they had come together, they asked Him, saying, “Lord, will You at this time restore the kingdom to Israel?” 7 And He said to them, “It is not for you to know times or seasons which the Father has put in His own authority. 8 “But you shall receive power when the Holy Spirit has come upon you; and you shall be witnesses to Me in Jerusalem, and in all Judea and Samaria, and to the end of the earth.” 9 Now when He had spoken these things, while they watched, He was taken up, and a cloud received Him out of their sight. 10 And while they looked steadfastly toward heaven as He went up, behold, two men stood by them in white apparel, 11 who also said, “Men of Galilee, why do you stand gazing up into heaven? This same Jesus, who was taken up from you into heaven, will so come in like manner as you saw Him go into heaven.” 12 Then they returned to Jerusalem from the mount called Olivet, which is near Jerusalem, a Sabbath day’s journey. (Acts 1:4-12). I’m thankful to say that all of our folks here continue to be well. Thanks for following our blog. You are currently browsing the Leon's Message Board blog archives for November, 2016.